Odor Ninja will wipe out and eliminate--with quiet ninja skills--the unpleasant odor of coatings, leaving a pleasant smell in its place. Odor Ninja can be applied to any of our coatings and will reduce its smell, making it easier on techs spraying, as well as tenants. Odor Ninja is available in two sizes: 8 oz and 32 oz bottles. Try Odor Ninja in the 8 oz size to compare against other similar products. Then, buy the 32 oz size to save even more money! Two oz per gallon of coating and one oz with reducer (for a total of three ozs). 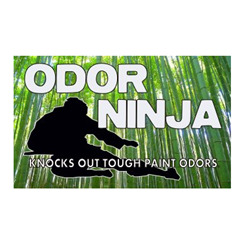 Odor Ninja will knock out tough paint odors. Try Odor Ninja in your lacquer thinner and your clear coat!